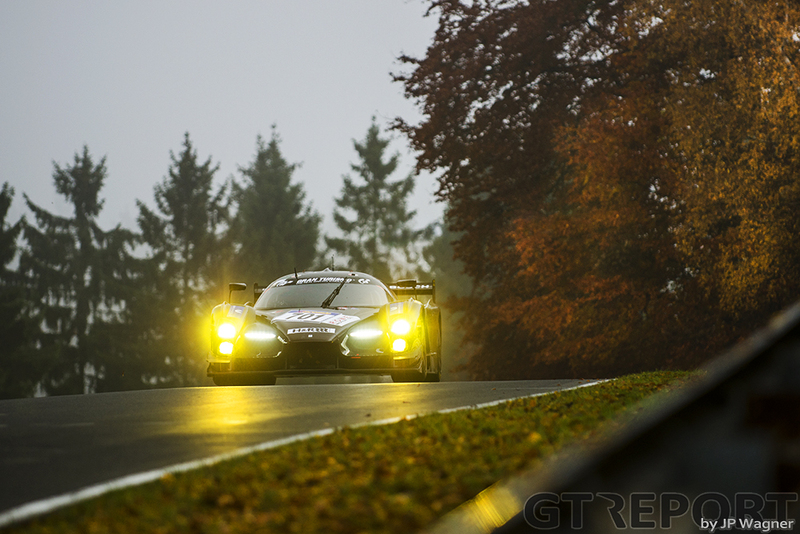 Autumn in the Eifel is always a special time of the year. The colourful leafs, mist and a low autumn sun come straight out of a fairy tale. 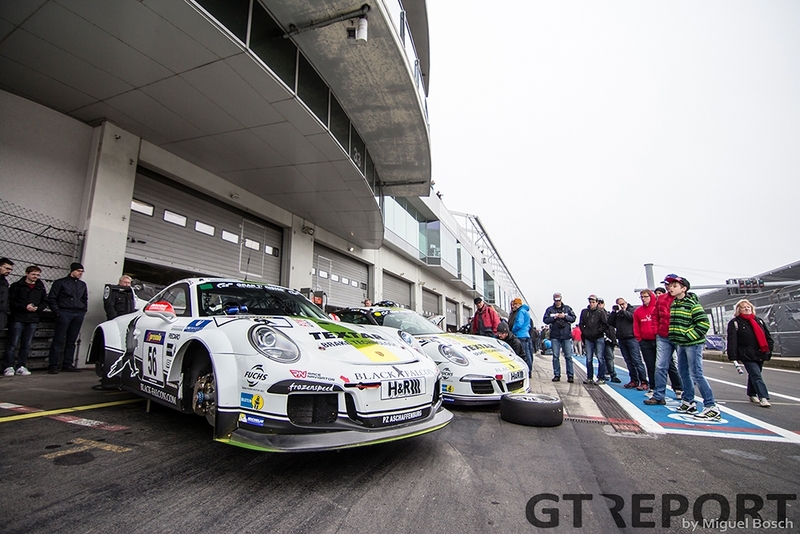 Like in fairy tales, magic sometimes seems to happen at the Nürburgring. Today is such a day, when out of the fog appears a winner no one saw coming. 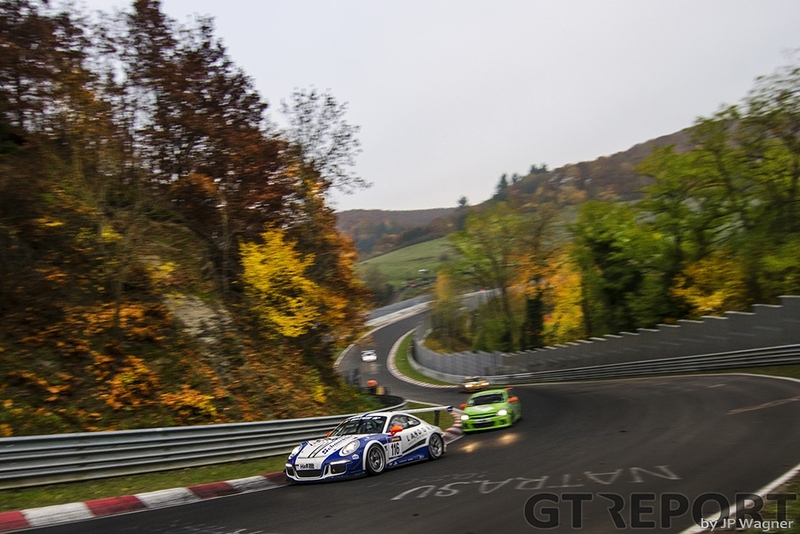 Each year when the end of October comes around and the last scheduled race of the VLN season is supposed to take place, teams, drivers and fans alike can only hope that the weather will play along. After races under a nice late summer sun, the gods of weather are now making up for it. Last time out qualifying had to be postponed because of fog. When it did clear, the near freezing temperature remained. Today is no different: thick fog has covered the track, keeping the 40. DMV Münsterlandpokal from starting. After hours of waiting, the word from race control is that visibility, at least at most parts of the track, is good enough to finally go head with qualifying. With a close battle over the Speed Trophäe between the Frikadelli Racing Porsche 997 GT3R of Klaus Abbelen, Sabine Schmitz and Patrick Huisman, the Walkenhorst Motorsport BMW Z4 today raced by young talents Jesse Krohn and Victor Bouveng, and outsiders Twin Busch Motorsport Audi R8 LMS ultra GT3 team of Marc and Dennis Busch and Marc Basseng, there are still prizes to win. At the end of the shortened practise session it’s Walkenhorst that takes pole. With a time of 8:01.303 the BMW breaks the record of the year, courtesy of the fast Dunlop qualifying tyres. 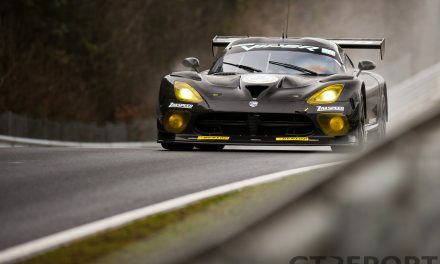 Next to the team from Melle starts the beautiful Scuderia Cameron Glickenhaus SCG003c of drivers Thomas Mutsch, Jeff Westphal and Christian Menzel. 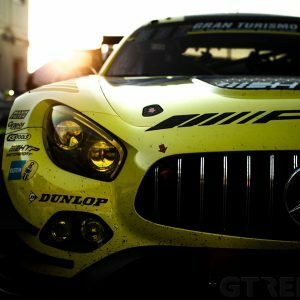 They are closely followed by Car Collection Mercedes-Benz SLS AMG GT3, with the Dutch duo of Indy Dontje and Renger van der Zande, and Car Collection-regular Kenneth Heyer behind the wheel. The team says goodbye to its trusted SLS today, switching to the new Audi R8 next year. Frikadelli and Twin Busch have to settle for respectively fourth and sixth place on the grid. Qualifying also gives us the first glimpse of the phenomenal speed of the Black Falcon Porsche 991 GT3 Cup BF. Regulars Gerwin Schuring and Manuel Metzger and occasional guest racer Philipp Eng qualify the white car in eighth, right between the massive GT3’s. When Car Collection announced its drivers line-up in the week before the race it was instantly clear that the goal of the team from the tiny town of Walluf was to win. 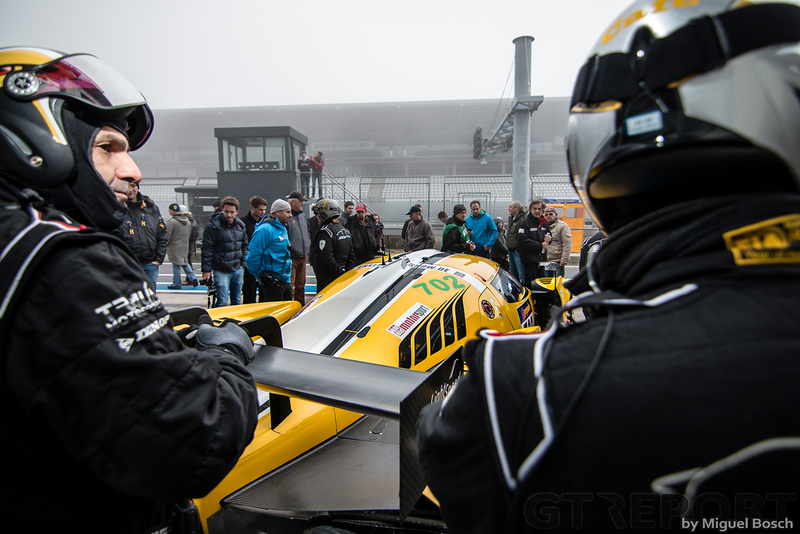 Living up to this high standard, Renger van der Zande immediately takes the lead at the start of the race, with Jesse Krohn on his back and the yellow SCG003c of Thomas Mutsch following. On lap two Krohn sees an opportunity to overtake Van der Zande at the braking zone for Aremberg. The BMW Junior retakes the lead–arguably in a yellow flag zone–and drives off to reduce ground that he will lose when he has to come into the pits to serve a stop-and-go penalty for ignoring yellow flags in qualifying. Car Collection goes back in front when Krohn enters the pits for his penalty at the start of the fourth lap. However, while overtaking lapped cars in the Mercedes-Benz Arena, Van der Zande gets hit by Mutsch. Twin Busch driver Dennis Busch takes advantage of the fighting GT’s and forces his way past the Dutchman. One lap earlier Patrick Huisman parked his Frikadelli Porsche in the pit box. An electrical issue has plagued the multiple Porsche Supercup champion in the opening laps, ending the team’s short lived race. 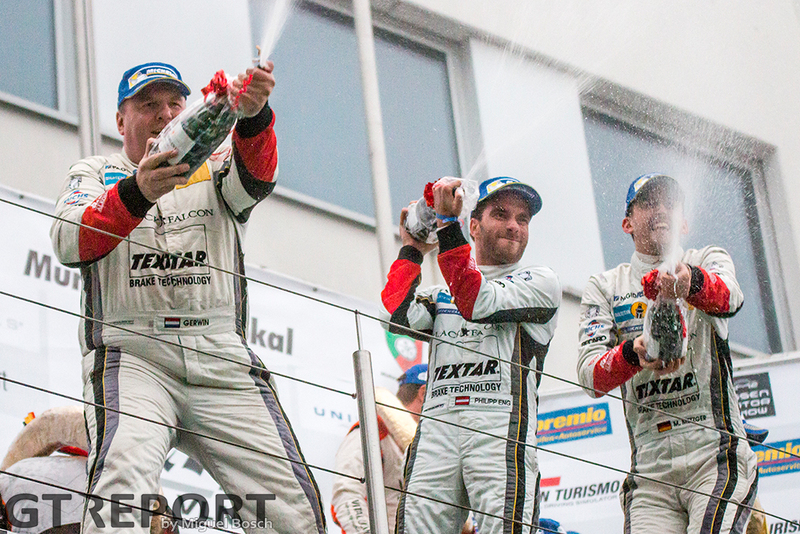 Frikadelli’s retirement leaves the door wide open for Walkenhorst to win the Speed Trophäe. 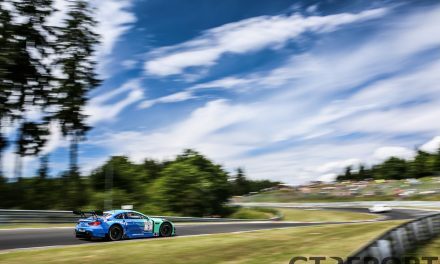 Trailing the Barweiler squad by just four points means finishing seventh is enough for the BMW team to defeat Frikadelli. Twin Busch, however, is eleven points behind, needing at least a fourth place if Walkenhorst finishes the race in eighth or worse. Taking the lead of the race is a good start to Twin Busch’s assault on the crown. The yellow-blue car leads the field for most of the afternoon, while different pit stop strategies hand first place temporary to other cars. One such car is the Black Falcon Porsche. It’s Austria’s talent Philipp Eng who starts the race and continues on to set an astonishing pace, keeping up with the GT3’s. Stretching his stint into the eighth lap, he then hands the Porsche over to Manuel Metzger. 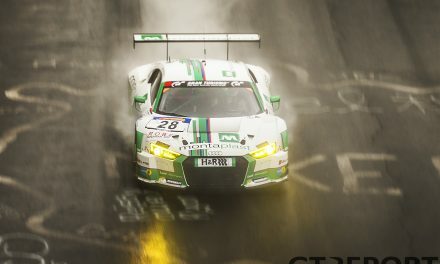 The winner of VLN9 maintains the pace, setting lap times that are never more than just a few seconds slower than the Twin Busch Audi. The last stint is for Gerwin Schuring. 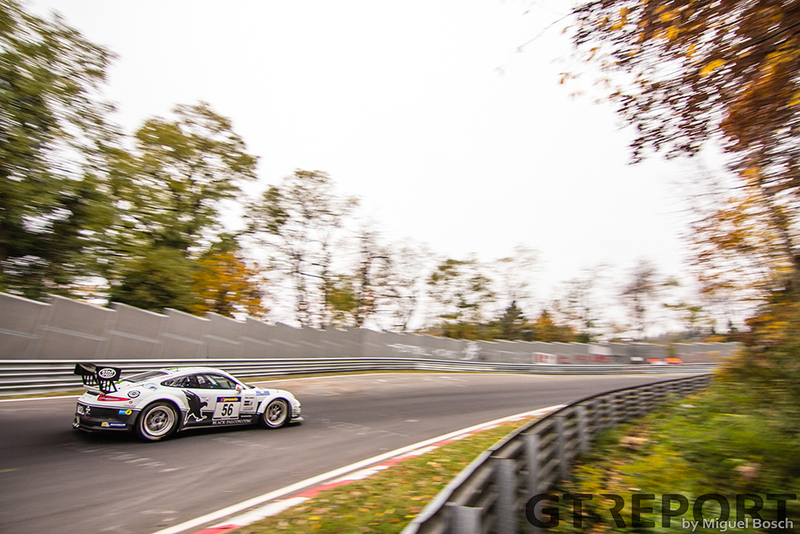 The Dutchman leaves the pits without losing a single position, leading the field of GT3’s around the mountain course. 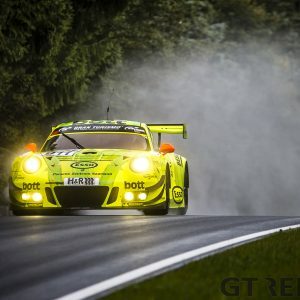 Up against the mighty GT3 machines, it’s just a matter of time until Schuring sees the giants appear in his rear view mirror. 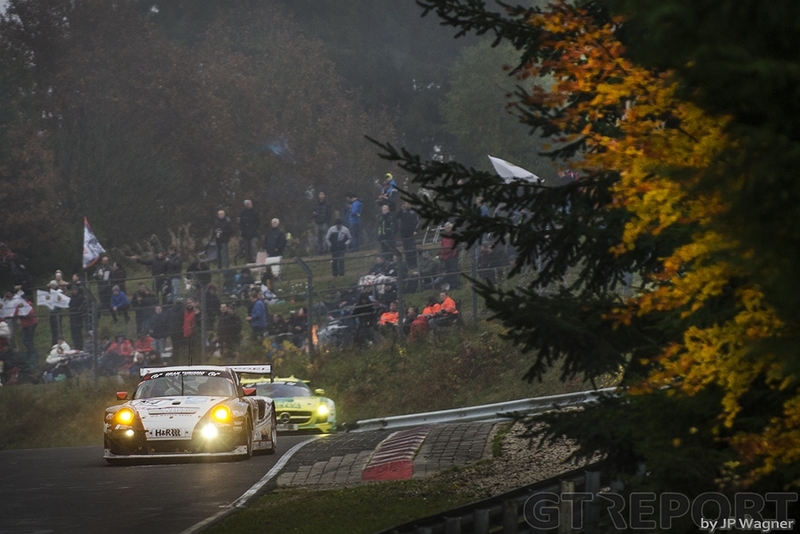 Twin Busch goes past, but it doesn’t matter any more: the fog is returning and an oil spill at Brünnchen has sent cars crashing into the barriers. 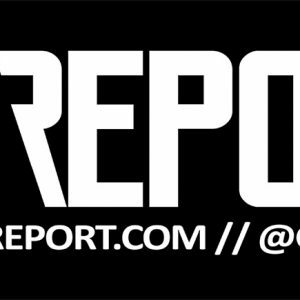 There’s nothing left to do for race control than to wave the red flag and put an end to the race. Going back two laps, Black Falcon is back on top of the charts, victorious in the last race of the year. Next to the exuberant trio on the podium are the Scuderia Cameron Glickenhaus guys. Manuel Lauck, Franck Mailleux and Jeroen Bleekemolen have just brought home the very first podium finish for the SCG003c. 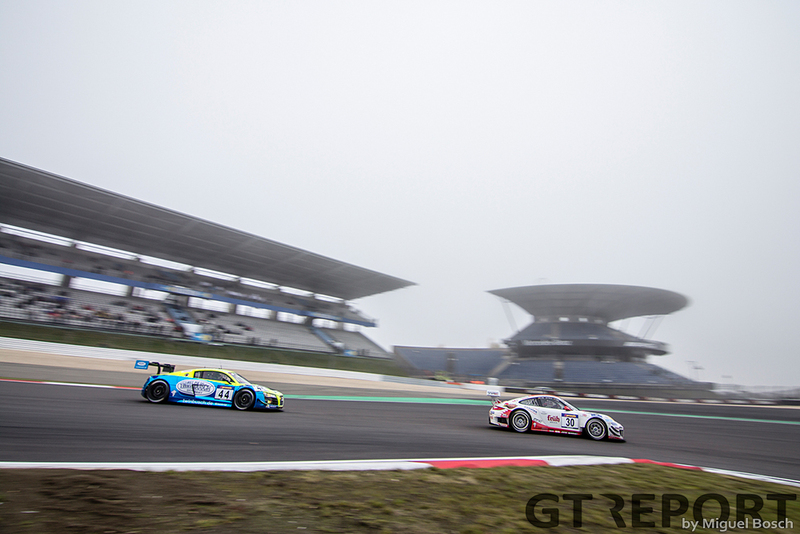 They, too, got lucky with the moment at which the red flags appeared: late race problems with the fuel pump have thrown the carbon black GT out of contention for the podium. Black Falcon isn’t the only SP7 team to make it onto the podium: the Frikadelli Racing Porsche 991 GT Cup America of Frank Kräling and his co-driver Christopher Brück join their season long competitors on the podium, finishing a remarkable third place. Less joy at Twin Busch. To the dismay of the Speed Trophäe aspirants, the race is stopped just one lap too early. The small team is leading when the red flag is shown and would most likely have won if the race went the distance. Just not today, not over the nearly two and a halve hour that were scored. Twelve points is not enough to beat Walkenhorst, who take eight points with their sixth place finish, and with it the Speed Trophäe. Red flag or not, Black Falcon was inbound for a great result regardless. 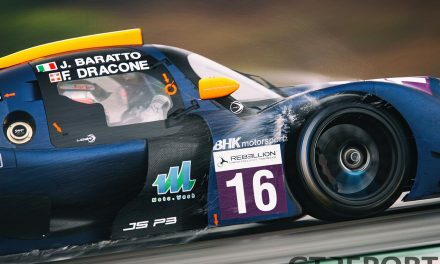 The team might have gotten lucky with the red flag, but it was the culmination of seven months of hard work and sheer talent that put them in the position to turn luck into victory. No magic needed. 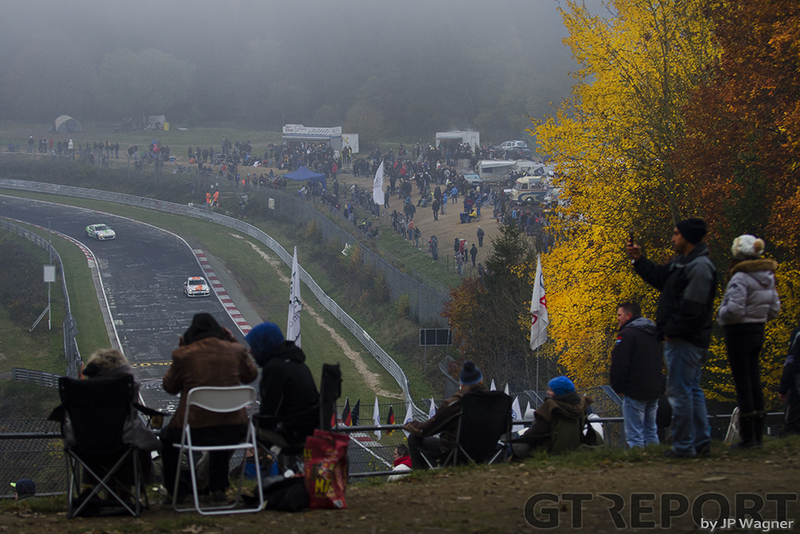 Now the Nürburgring goes to sleep for the winter. Snow and ice will soon take a hold of it, only to be woken up in March.